In the winter I am a cozy sweater and jeans kind of girl. I am always freezing. Always. It is a little embarrassing what I keep my thermostat set at in the cold winter months. So if you are anything like me, you may have a few cozy sweaters on your list to Santa. A few weeks ago as I was trying to figure out what to wear in the morning, I realized that my wardrobe was seriously lacking in the sweater department. While my closet looks like it is overflowing, the reality is that the majority of my sweaters are from years ago when my son was a toddler. He is now almost nine! Why are sweaters I don’t even wear anymore still hanging in my closet? I am going to blame my lack of new sweaters on my two year old. If you have been following my blog posts you know that she is a nightmare to shop with. You can read more about my shopping adventures with her here. Shopping in an actual clothing store rarely happens for me anymore. However I am happy to report that with the exception of the second to last sweater featured here, the rest I was able to try on in a dressing room by myself! The things I love about each and every one of these cozy sweaters is that they are easy for us busy mamas to throw on, yet still stylish. Add a few accessories and I can at least look somewhat pulled together. Another bonus? With all of the holiday sales going on this time of year, the sweaters below are also very affordable. Which means you can buy more than one, right? Since we are almost officially in winter, I figure we could all use a few new cozy sweaters in our closet! Everyone needs a good, long, cowl neck sweater in their wardrobe. Talk about the ultimate cozy sweater. I could curl up on my couch snuggled up in this sweater reading a book all day long. That is if I didn’t have three kiddos! 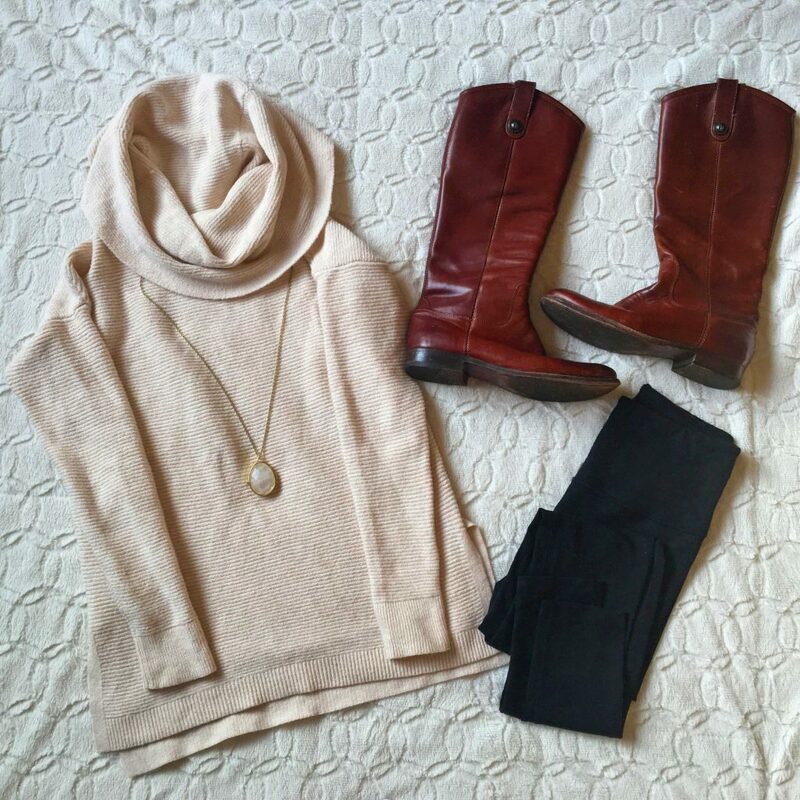 This cowl neck is the perfect sweater to throw on with a pair of leggings and taller boots. Such an easy outfit for running around and chasing the kids all day long. I feel like the pictures online don’t do the sweater justice…while it is oversized, it is not quite as baggy on me as on the model. Lately I have been purposefully putting outfits together around my shoes. I need them to be low heel and easy to run in if my sweet toddler decides she is going to “run away mommy” like she pretty much says to me every time we are shopping somewhere. At least I am getting in a bit of a workout chasing her! And giving some good laughs to everyone else around us! A girlfriend of mine actually pointed out this flare sleeved pullover to me when I ran into her while shopping on Black Friday. She was joking about how she was trying on basic, boring sweaters, and this happened to be one of them. While it appears basic at first glance, the flare sleeves add a little fun twist to make it not so basic! 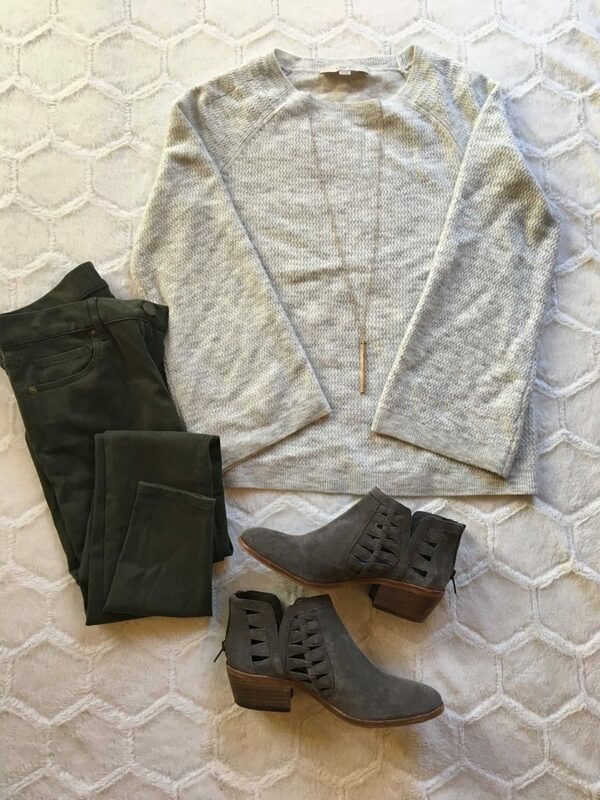 This particular sweater is not online, but The Loft does carry it in their stores. I love the classic grey color, but if you’d like something a little brighter, here is a similar sweater that they do carry online. I’m sure this sweater is going to end up under many Christmas trees this December! I’ve actually had this fleece button wrap for a few years, but I still love how cozy soft the inside feels. I ordered in my normal size, although it does recommend ordering a size down. You know it must be good if Nordstrom still carries it year after year, right? The lace up sides totally sold me on this red sweater. That and the fact that my closet is completely void of red convinced me that I needed to purchase this to wear for the holidays and beyond. Another plus? Buying a red sweater also finally pushed me over the edge to try red lipstick. Which I totally love now. Just need to buy my own tube as I have been borrowing it from my 11 year old who uses it for her dance performances! A list on cozy sweaters wouldn’t be complete without an oversized cardigan. Right now this is by far one of the coziest sweaters I own. You may be shocked to find out that it is from Target! I feel like lately they have been upping their game in the clothing department, which is great for us busy mamas. One stop shopping that is fairly easy on the wallet! I was racing around our local Target one day trying to find a blush cardigan for our family Christmas card picture and lo and behold there it was right in front of me. Just as I was about to try it on my toddler bolted and I ended up losing both her and my eight year old (who took off after her). Instead of trying it on in store I threw the sweater in my cart and set off to find them. When I was finally able to try it on at home I kicked myself for only buying it in the pink color. I should have bought another one. Guess that means I need to make another trip to Target! Although it is a little oversized, I bought my regular size in this one. There you have it, my favorite cozy sweaters so far this winter. If you still have a few ladies on your list to shop for, any of these would be great to give as a gift as well. Thank you Ava! I will have to check out Banana Republic too. They do have cute sweaters and I always forget to check there!! This is great!! (: I just bought an adorable sweater from marshals that I am obsessed with!! Thank you Taylor! I need to have more patience to shop at stores like Marshals and TJ Max. I have some friends that find some great things there! You do pick out cute cozy sweaters! I love the ones that you have given me. I wore the lavender one you gave me a few years ago and stayed warm all day. Thank you! I love picking out sweaters for you!